When people hear that a chain of quick serve restaurants (QSRs) is working with a business music service provider, many wonder why. After all, aren’t in-store music services for retail shops and corporate office settings? More and more, the answer to that question is a resounding NO. The reason is that those who own multi-location QSRs (and single location traditional restaurants for that matter) are finally discovering the benefits of having carefully curated and professionally executed restaurant music. 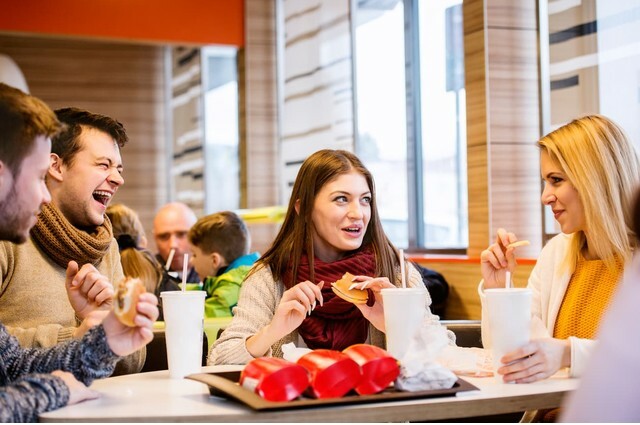 What follows are eight of the most compelling reasons why in-store music is good for business at quick service restaurants around the world. 1. Music helps build brands. Along with interior design and décor, the music played inside a QSR is a key part of the “A/V” portion of the restaurant brand experience. What customers see and hear when they enter a QSR location is the vision of the brand brought to life. Without the music to help “tell the story” that experience would be much more two-dimensional and a great deal less powerful. 2. Music removes a customer’s fear of the unknown. In the Quick Serve Restaurant business, familiarity is NOT a negative thing. The owners of large chains want a customer who has never been to Miami, Florida in their lives, to step into one of their QSR locations there and feel immediately comfortable. One of the most pronounced methods of accomplishing this is through the use of music – specifically by using a uniform set of music in ALL locations around the world to create a familiar environment for a loyal customer to enjoy. 3. Done professionally, restaurant music creates happier employees. Say you told your Employee of the Month that she could bring a thumb drive containing her “favorite album ever” to work, and play it all throughout the workday. Chances are, it would take less than a day for that beloved hour of music to become Public Enemy #1 with your prized employee and her co-workers. But, if each day promised a new and exciting mix of the best music, suddenly, your in-store music program would be something that employees would look forward to hearing every day – which would make them happier, more productive individuals while on the job. 4. Music played in restaurants can mask unwanted sounds. If you took your average city-located, busy QSR and removed the in-store music, you’d be “treated” to all kinds of sounds that you never heard before…and may never want to hear again. It’s good to love your fellow man, but that doesn’t include the sound of his chewing – something that you’ll never have to hear thanks to music played in-restaurant at just the right volume. Same goes for sounds from the bathroom, the kitchen area and even the conversation of fellow diners – who’s appropriateness is simply impossible to predict. 5. Music creates a more immersive brand experience. If a 150-store Mexican-themed QSR decorates their locations with everything from sombreros and ponchos to festive trinkets from the Day of the Dead, you could argue that they’ve done a pretty good job creating an authentic Mexican décor. But add traditional music from that country’s many leading artists, and play these songs throughout the day in the restaurant, and now you have created a truly immersive brand experience that will have a very positive impact on customers. 6. Music soothes the savage customer. Imagine your QSR chain’s busiest location during the lunch rush. As hard as your valued employees work to avoid it, there’s a line building at checkout and it doesn’t look like its getting shorter anytime soon. Understandably, this may cause some of your valued customers to grow restless or frustrated. But if the right music is playing on the QSR’s sound system, be it a new musical discovery or an old favorite from days-gone-by, that wait may just be easier to take. As a result, music saves the day again by distracting customers from the kind of common frustrations that all restaurants experience at one time or another. 7. Music can be segmented to appeal to different types of customers at different times. A QSR may be full of busy office workers at lunchtime, but later becomes the destination of choice for older theater-goers who are looking to take in some carbs before the touring company of their favorite Broadway show raises the curtain in the evening. Dayparting is the process of selecting genres of music to play based on the demographic most likely to be in a restaurant at a certain time of day. It’s a custom music solution that helps the young office worker and the older theatergoer BOTH hear music that speaks to them when they are dining at the QSR. 8. Music creates a more immersive brand environment…provided QSRs use the right equipment. There’s little point in investing time and money into the music that plays in your restaurant if you’re just going to play it all back on an old out of date sound system. Smart QSR owner search for deals that allow them to purchase and install high-quality speakers and media players in all their locations – so that the music mixes that are designed to help grow their business can be heard by everyone with top notch clarity. The same is also true for media streaming devices, where cutting costs or going with out of date equipment can potentially lead to interruptions in data transmission, which in turn creates awkward moments of “dead air” inside the restaurant. For the best, most affordable in-restaurant music for your QSR or individual restaurant location, visit Cloud Cover Music today. Cloud Cover Music has helped eateries of all kinds across the United States implement affordable and legal (ASCAP licenses, BMI music licenses, and more) music programs for their business. To start getting the best in-store music for your QSR, visit the Cloud Cover Music website and sign up for a 14 day FREE trial of the same services that have already helped restaurants like yours enjoy the benefits of in-store music, all at a price point that won’t break the bank.